Cambridge, Mass. - June 4, 2012 - A pair of new studies by computer scientists, biologists, and cognitive psychologists at Harvard, Northwestern, Wellesley, and Tufts suggest that collaborative touch-screen games have value beyond just play. Two games, developed with the goal of teaching important evolutionary concepts, were tested on families in a busy museum environment and on pairs of college students. In both cases, the educational games succeeded at making the process of learning difficult material engaging and collaborative. The findings were presented at the prestigious Association for Computing Machinery (ACM) Special Interest Group on Computer-Human Interaction (SIGCHI) conference in May. The games take advantage of the multi-touch-screen tabletop, which is essentially a desk-sized tablet computer. In a classroom or a museum, several users can gather around the table and use it simultaneously, either working on independent problems in the same space, or collaborating on a single project. The table accommodates multiple users and can also interact with physical objects like cards or blocks that are placed onto its surface. The new research moves beyond the novelty of the system, however, and investigates the actual learning outcomes of educational games in both formal and informal settings. “Do we know what the users are actually learning from this? That question is a step beyond the research of the past 10 years, where we’ve been seeing research publications that assess how well the system is performing, but not addressing how well it’s accomplishing what it’s really designed for,” says principal investigator Chia Shen, a Senior Research Fellow in Computer Science at the Harvard School of Engineering and Applied Sciences (SEAS) and Director of the Scientists’ Discovery Room Lab. The two collaborative games that have been developed for the system, Phylo-Genie and Build-a-Tree, are designed to help people understand phylogeny—specifically, the tree diagrams that evolutionary biologists use to indicate the evolutionary history of related species. Learners new to the discipline sometimes think of evolution as a linear progression, from the simple to the complex, with humans as the end point. The Phylo-Genie game (see video below), developed by researchers at Harvard, Wellesley, and Tufts, attempts to address the misconceptions that students hold even at the college level. Designed for a formal classroom setting, the game walks students through a scenario in which they have been bitten by an unusual species of snake and must identify its closest relatives in order to choose the correct anti-venom. The researchers tested Phylo-Genie on pairs of undergraduate students who had not yet taken a course in evolutionary biology. Other pairs of students were given the same exercise, but in a pen-and-paper format. In comparison to the paper version, the electronic game produced statistically significantly higher scores on a post-test (an exam borrowed from a Harvard course), as well as higher participant ratings for engagement and collaboration. Both of the phylogeny games were designed and evaluated in accordance with accepted principles of cognitive psychology and learning sciences. The Build-a-Tree game was designed with an informal museum environment in mind. Researchers on this project, directed by lead author Michael S. Horn at Northwestern University and Shen at Harvard, observed 80 families and other social groups interacting with the Build-a-Tree game at the Harvard Museum of Natural History. The game asks users to construct phylogenetic trees by dragging icons—for example, a bat, a bird, and a butterfly—toward one another in the correct order. As the user progresses through several levels, the problems become more challenging. The idea, Shen says, is to encourage what museum science educators call "active prolonged engagement," as opposed to "planned discovery." 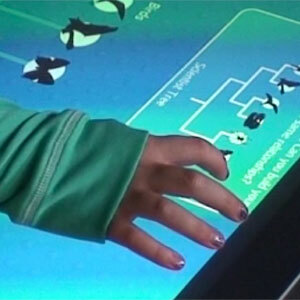 The former allows learners to explore information independently and to interact with it in an open-ended manner; the latter approach, common in natural history museums, guides the user toward a particular set of facts. "Natural history museums have always been a place where the exhibits are behind glass in the gallery," explains Shen. "You come here to see things that you just don’t see anywhere else—fossils millions of years old—and you come here to learn. You see school groups and parents coming in with a serious mind, and we’re breaking into that culture." The Build-a-Tree game performed well against established measures of active prolonged engagement and social learning. Even in the most high-tech exhibit hall, where visitors are engaged at every turn, it takes a great deal of creative thinking to demonstrate a phenomenon that is essentially imperceptible in real time. The work on Build-a-Tree was supported by the National Science Foundation, with research evaluation conducted in the Harvard Museum of Natural History. Horn (lead author) and Shen worked with Zeina Atrash Leong (Northwestern University), Florian Block (a postdoctoral fellow at SEAS), Judy Diamond (University of Nebraska State Museum), E. Margaret Evans (University of Michigan), and Brenda Phillips (a postdoctoral fellow at SEAS). The work on Phylo-Genie was supported by the Encyclopedia of Life Learning and Education group and by the Museum of Comparative Zoology at Harvard. Shen's collaborators were lead author Bertrand Schneider (a graduate student at Stanford University, who completed the work as a visiting student at Harvard), Megan Strait (Tufts University), Laurence Muller (a visiting student at Harvard), Sarah Elfenbein (a recent Wellesley graduate, now at Yale University), and Orit Shaer (Wellesley College).